Very good location, 5 mins walk to Petra main entrance. Staff was friendly, help us book the local bus to Wadi Rum in the early morning. The room was large enough with plenty of spaces to store the bags. Location is fabulous, just a short walk to the Petra main gate. Check in was easy and they gave you great tips on places to eat and tips for visiting Petra. Great value for the price. Parking a huge plus. Good location. Parking. Zaid was very nice and ready to help with anything. Great location next to Petra entrance, near some restaurants and shops. Good breakfast. Nice staff. The location was great. 10 minutes walking distance to visitor's center. Very friendly staff and good position, a few minutes walking from the entrance of the archaeological site. Prime location next to the entrance gate. Unless you stay at the Movenpick you can't get any closer. Perfect for people like me who wanna explore Petra early (opens at 6 am) and reassuring if you do Petra By Night that you don't have to walk too far in the dark. Great rooftop restaurant next door (My mom's recipe, I think) with excellent food. I accidentally paid 30 JOD too much on arrival (I never realized) and two days later the host called me over to reception to give me back the money they owed me. If they wouldn't have told me, I would've never known. So super nice, honest and helpful staff, kudos! The hotel is located next to the Petra gate. The staff is extremely friendly and helpful which compensates for the fact that the hotel is quit old and could use a makeover. But we have a fantastic stay and can only recommend it to other which doesn’t want to spend a fortune staying one night in Petra. 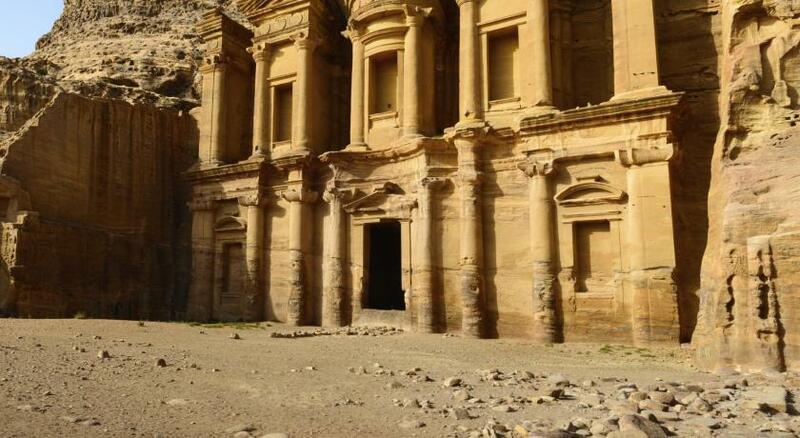 The hotel was a fantastic location to explore Petra - literally 100m up the street from the main entrance. We were able to park our rental car, the shower pressure was great and nice and hot, rooms were large with plenty of space to store the bags, large beds. There were supermarkets and restaurants surrounding the hotel which were convenient, but expensive. Silk Road Hotel This rating is a reflection of how the property compares to the industry standard when it comes to price, facilities and services available. It's based on a self-evaluation by the property. Use this rating to help choose your stay! The Silk Road Hotel is located in Wadi Musa and is only a 3-minute walk from Petra’s main gate. It offers air-conditioned rooms with panoramic views of the Petra Valley. Rooms at Silk Road are spacious. They have seating areas, satellite TV and private bathrooms. Some rooms have large windows that overlook rose-red cliffs. At the restaurant guests can enjoy a complimentary buffet breakfast. The hotel provides on-site free private parking, packed lunches and 24-hour front desk service. The Silk Road Hotel is located steps away from The Petra Visitors Center which provides taxi and car rental services. When would you like to stay at Silk Road Hotel? This twin/double room features air conditioning, tile/marble floor and satellite TV. This triple room features a tile/marble floor, air conditioning and satellite TV. House Rules Silk Road Hotel takes special requests – add in the next step! One child under 2 years is charged JOD 5 per person per night in a crib. Silk Road Hotel accepts these cards and reserves the right to temporarily hold an amount prior to arrival. Please inform Silk Road Hotel of your expected arrival time in advance. You can use the Special Requests box when booking, or contact the property directly using the contact details in your confirmation. The restaurant right next to the hotel is overpriced and the food is bad. Hotel was in very old style, need to be renovated. The breakfast can not be taken away if you leave early at 6:00 am like we did, staff in reception said they didn't have box to put food in. Breakfast was pretty dismal, with only one un-appetising hot option and not much else available - disappointing considering you want to feed up before a day at Petra. The hallways and corridors were musty, a mix of cigarettes and perfume so that was pretty unappealing. Sound definitely echoed from corridors as well but thats more of a case of guests being inconsiderate and not necessarily the hotels fault. If you have a car, drive into the town centre up the road to eat as everything is half the price of the restaurants that surround the hotel. Feeling a bit like "lost in space"
Hotel desperately needs renovating, breakfast was poor. Silk Road Hotel is FILTHY. I had to ask for clean towels as the ones we had in the room were used dirty towels from the previous guests. Lilac sofas in rooms were all stained and very dirty that we didn't even touch them, fitted carpets around the hotel also stained. Furniture and hotel in general very outdated. Room door and window to the main road did not lock!! Bath was stained and sanitary-ware broken, bathroom even had some tiles missing. Hot water is not available all the time!! Specific hours where you could have warm water, whilst the water pressure was very poor. Worst shower experience ever. Pleated lampshades broken and dusty. Staff fully unmotivated to do anything. I would avoid staying there at all costs. Do yourself a favour and find another hotel !! We didn't even take our breakfast, as we left from there very early in the morning, because we couldn't help staying longer in that place. Just wanted to get out of this dump. A big let down on the whole, considering the price for one night. The furniture is very old, TV is broken and the bathroom is rusty. However you have all the basics you may need for your stay. The hotel is in a perfect place, close to the entrance of Petra. The staff at the desk was very kind to us and overall our stay wasn't so bad. The bed is also really comfortable. When I checked in the guy who helped me to my room asked to take a “check in selfie” with me. My friend, who had another room in the hotel, was not asked to do this. I’m pretty sure the guy was being a creep and it made me very uncomfortable that he tried taking a photo of me in my room. Bathroom was disgusting and no hot water. Very close to the entrance/visitor center of Petra. Lots of restaurants nearby. This hotel is in desperate need of a major renovation as everything is a bit old and run down, particularly the bathroom and all communal spaces. Breakfast was basic and all cold food. I ate an evening meal in the hotel restaurant and was the only diner. Food was cheap and plentiful but only average taste. Large and comfy bedroom with lots of natural light and seating. Very friendly and welcoming staff. Excellent location right by the entrance to Petra and with good restaurants and shops nearby. The bed sheets were old and the bathroom tap was bad. Breakfast can use a bit of improvement. But it was satisfactory. Guy at reception (longer curly hair with glasses) was very nice and helpful. Recommended amazing tour in Petra and great restaurant for dinner. In general, stuff is very nice and friendly. Location amazing. Bit old property. Break fast limited options. Neat n clean, just 2minutes walk from petra visitor centre. Staff nice n ready to help.